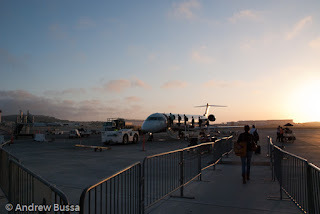 Did you survive Memorial Day travels? There's not much to look at in Tucson airport. It's new, clean, and over built. 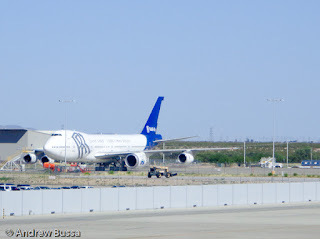 Outside there terminal, there are many interesting aircraft, like a Lockheed L-1011, a fleet of CRJ's, and the Rolls Royce engine test 747-200. 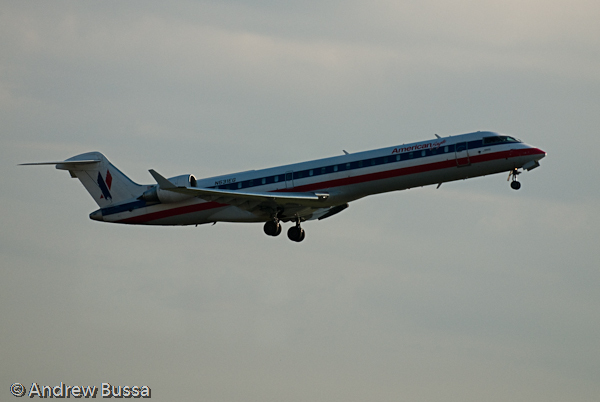 Good luck with Memorial Day travel this week. 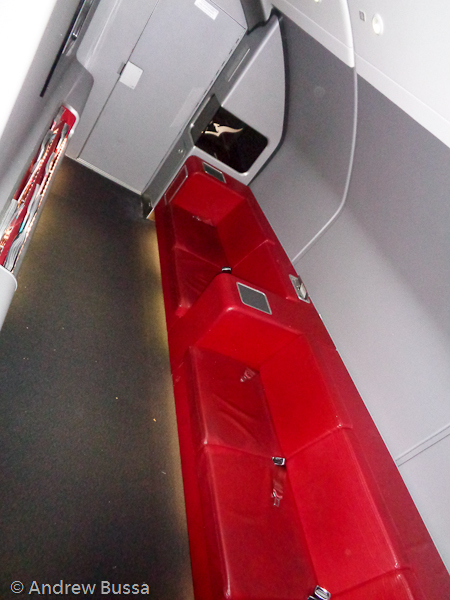 It's a tight squeeze on QANTAS's 737's in business class. The seat is ok and there's a TV in arm rest. 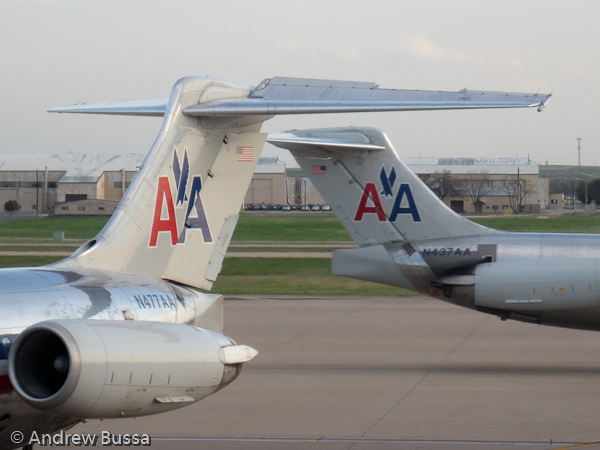 The food, drink, and crew service were fine, but try for a widebody if you can. Air New Zealand, Emirates, and LAN all fly large planes with flat beds on the 4 hour hop over the Tasman. I booked my round the world trip because of this flight. 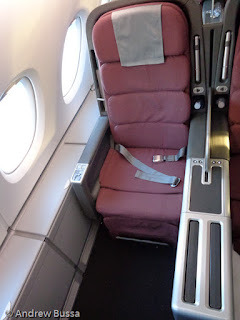 Premium cabin award space between North America and Australia/New Zealand is rare and it is not a flight to attempt in coach. 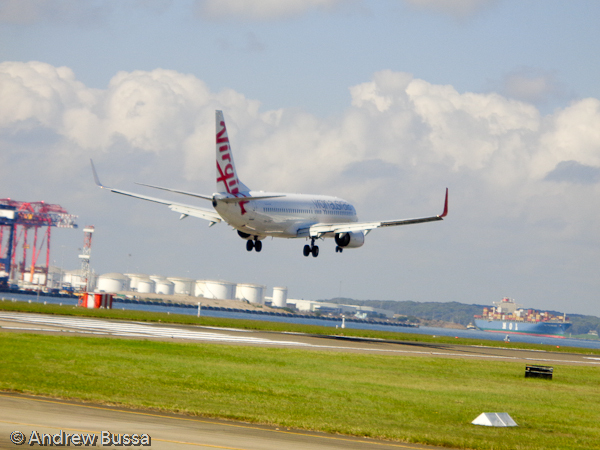 It was the longest flight in the world too when I booked QF8, DFW-SYD. Emirates launched a flight to Auckland two weeks before my trip, so it wasn’t the longest flight available when I flew it. 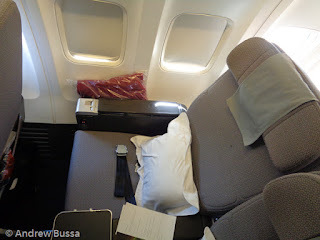 I was still excited for 17+ hours in QANTAS business class. 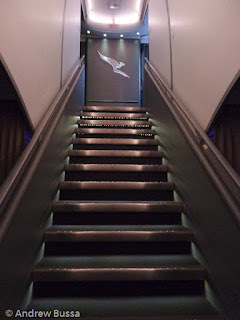 QANTAS launched their A380 service in 2008. 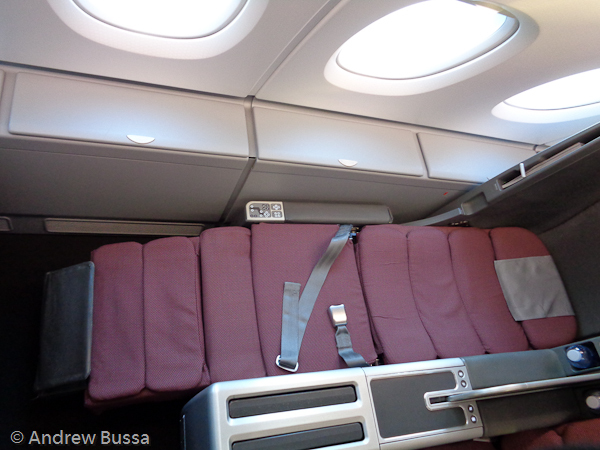 The aircraft interior has not been updated (excluding maintenance) since. Slightly angled flatbed seats were an average offering in 2008, but now feel dated. 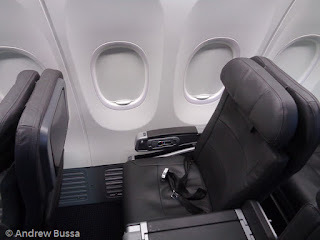 The TV’s are small and lower definition than newer planes. The feeling of privacy is also limited in business class. The seat is firm, the duvet added for flight helps slightly, but the flight was long enough to get 7+ hours of rest. The pajamas, or sleepy suit in Australian, were a fun touch, but not the most comfortable item to wear. 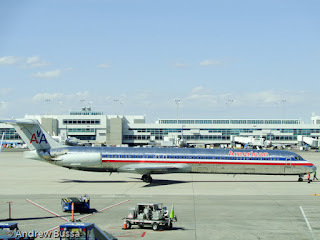 It also made a rush on the lavatories after breakfast to change (remember to change before landing; wearing pajamas in the lounge is a major faux pas). 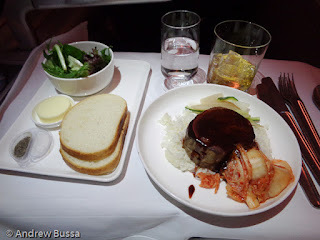 This was my first flight every on QANTAS and had high expectations from my brother and his adventures around Australia two years ago. The service and food were disappointing. The flight attendants were brief, almost curt, in their service. My pre-ordered steak was very well done. 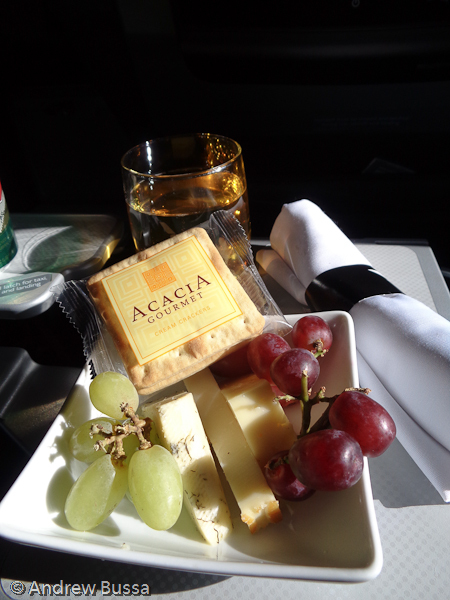 I picked at a sandwich later that was ok. British Airways’ premium economy food was on par with QANTAS business. I enjoyed the lounge in the front of the upper deck. I sipped a beer while reading and spreading out. I was less interested when chatty people found it later in the flight. I also went down stairs to stretch my legs and get the blood flowing. I expected more from a foreign carrier. The business class experience is 8 years old and needs to be replaced. Upgraded food service is an easier task that also needs to be done. 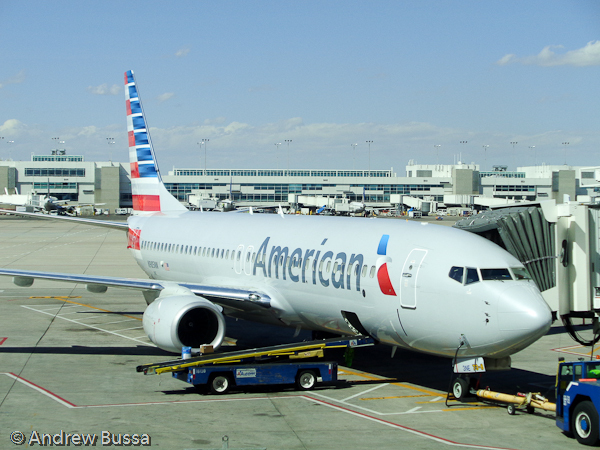 It was a good use of 65,000 American miles, but my expectations surpassed QANTAS's offering. Cranky Flyer did a great review of American Airlines' fleet since 2000. QANTAS is quirky. For example, their inflight maps show famous ship wrecks and the year of the sinking. This is useful on long over water flights with few landmarks, but also a little distressing. The shortest flight of my 30,993 mile RTW trip was the first leg from Denver to Dallas. 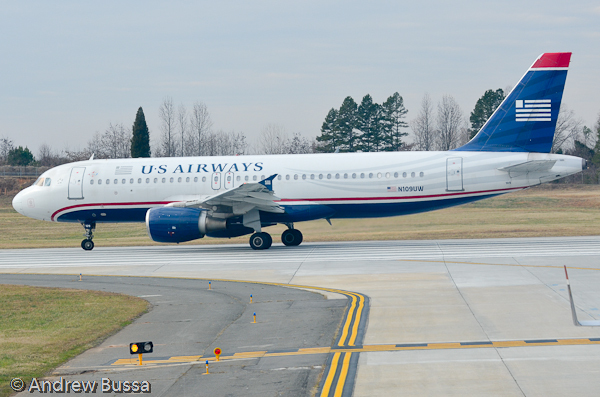 Originally scheduled as a flat bed 757-200, the aircraft type was changed to a 737-800 a few weeks before departure. This was a step down, but not as far as thought. I lucked out and got an almost brand new 737. I couldn’t tell from the outside, but once I stepped in, I noticed the Boeing Sky Interior bins and impressive looking new style seats. These were the best part of the flight. The TV screen was large and sharp. The aircraft was loaded with movie selections and I was able to fit in The Godfather on my way to Dallas. 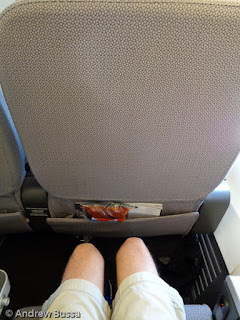 The seats were a little closer together than I'd like, but the person in front didn't recline. The flight was blocked at 2:05 and flew during dinner hours, so I ate light in the Admirals Club (not difficult). I was anticipating a hot meal service with two entree options. I was wrong. Cheese plate or a fruit plate were the options. Not bad as a starter, but that was it. Dejected, I enjoyed an amazing film and beer. 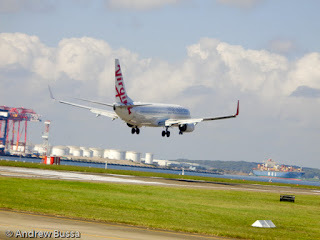 The flight landed soon after my movie and I was off to the QANTAS lounge for the most anticipated flight of the trip. American’s new first class seats put United’s new offering to shame. 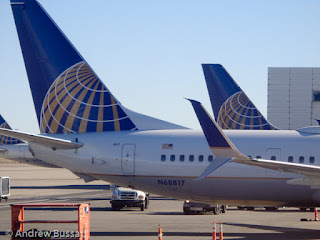 United has better meal service and a less chaotic boarding experience. It’s hard to choose a better option, because no one is being upgraded anyway. I cashed in about 250,000 miles and flew around the world last month. The trip was four one way awards, not a formal around the world award ticket. I feel like it gave me better value (way cheaper) and more flexibility (could book on different alliances). 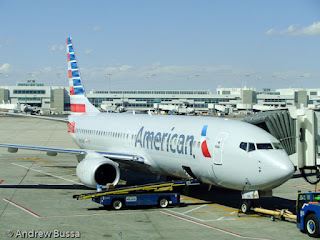 With American’s devaluation staring me down, I decided to redeem almost all my AAdvantage miles on an epic adventure. I went DEN-DFW-SYD-AKL in business class for about 65,000 American miles. Premium cabin award space to Australia is very difficult to find, so the DFW-SYD seat I found drove the timing of the trip. 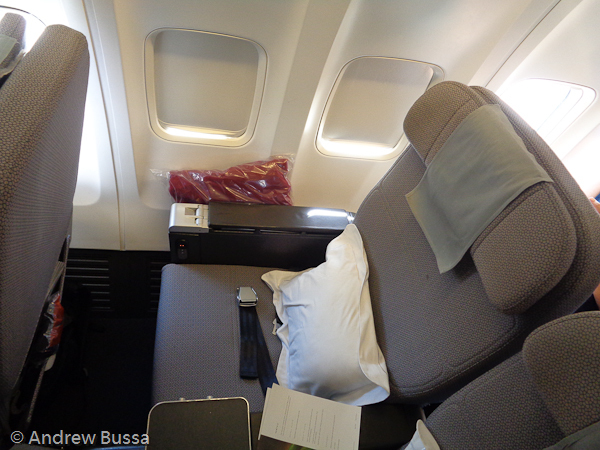 From there I flew AKL-SYD-PER on QANTAS with 17,500 American miles for business class. 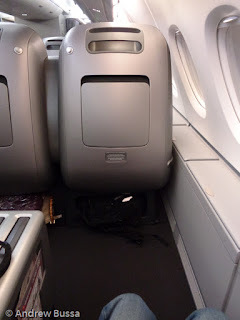 I wanted the direct on Air New Zealand’s 787, but no business class space was available and coach with United miles was the same price as business with AA. 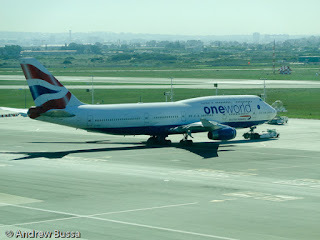 Perth to Cape Town, via JNB, was 85,000 United miles and good value. The other options were via Asia and North Africa. 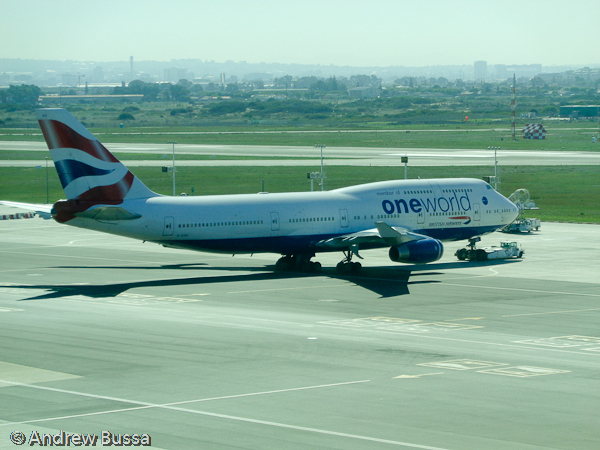 Cape Town to Denver was 100,000 AA miles for first class on British Airways via London. This was the best value because the ticket was only 25,000 more miles than London to Denver and I was in first for an extra 12 hours. 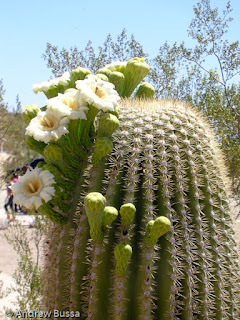 Enjoy some photos, I’ll have more detailed posts soon. It's time to fly was a better slogan than the new friendly campaign. 700 miles and a reset expiration date is a few clicks away. Air Mauritius will sell you an upgrade from Cape Town to Mauritius for ZAR1,600 any day. That's about $107 and great value for a 4.5 hour flight. 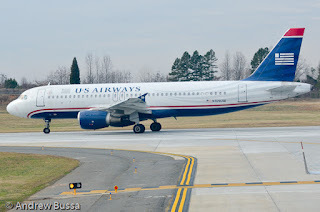 It's an A319, so don't expect flat beds, but the meal, space, and lounge would be worth it. 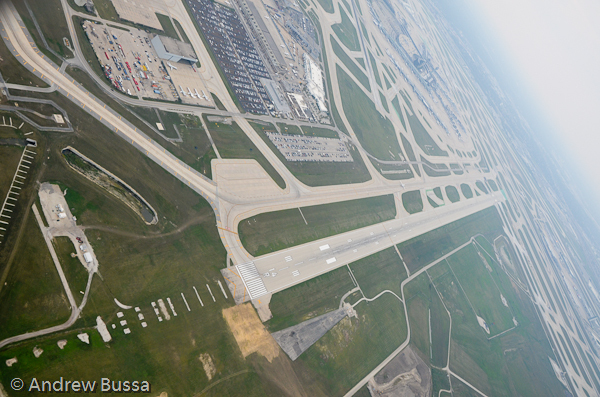 It's better to fly first, especially in an emergency. The guy on the safety card seems to enjoy the brace position. It's snowing in Denver this weekend. I'm dreaming of warmer destinations like LGB.